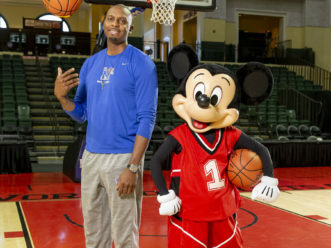 In his return to Orlando as a college basketball coach, University of Memphis head coach Penny Hardaway spent time with Mickey Mouse following a shootaround during the 13th annual AdvoCare Invitational. 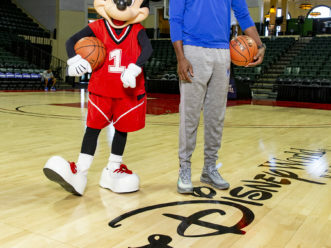 The three-day college basketball tournament took place over Thanksgiving weekend at ESPN Wide World of Sports Complex at Walt Disney World Resort. 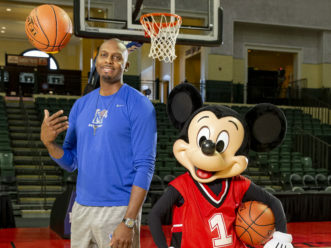 Hardaway posed for photos with Mickey Mouse and later, members of the Memphis basketball team snapped their own photos with Mickey and palled around with him on the court. In addition to Memphis, the tournament featured 2017 men’s national champion Villanova, No. 14 Florida State, No. 17 LSU, Alabama-Birmingham, Canisius, College of Charleston, and Oklahoma State. As an NBA player, Hardaway was a four-time All-Star and spent 16 seasons in the NBA, including seven with the Orlando Magic (1993-1999). Memphis, Hardaway’s alma mater, hired him to lead the men’s team in March.